The Life Insurance Corporation of India (LIC) Board approved the proposal of acquiring 51% of state run bank IDBI Bank. Government is aiming to make IDBI bank a vulnerable dynamic bank like Axis Bank. This acquisition is likely to be through issue of preferential shares. This is likely to bring some relief to IDBI Bank, through change of its fortunes. The shares to be issued might be through preferential issues, to augment the bank’s capital required. The other option is LIC can borrow from the Government. However, this would not provide any capital to IDBI Bank. 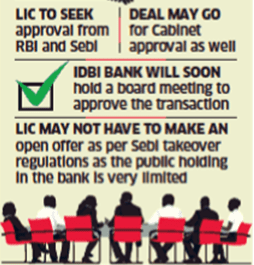 IDBI would be holding a Board meeting, to approve the transaction which is likely to be to the tune of Rs. 12,000 crore. Through the deal LIC will get 2000 branches of IDBI Bank, through which they can comfortably sell their products. Monetisation of IDBI’s real estate and non-core assets of value Rs. 14,000 is also another benefit that LIC would get. Critics have added that the premium amount paid to LIC by public will be utilized to bail out IDBI Bank which is not correct. LIC Unions have opposed the proposal on the ground that it will hurt the interest of policy holders. IDBI union adds that the Government had given an assurance on the floor of parliament that it would not allow its stake to drop below 51% but have backed out now, which has prompted them to go for a strike program which they will announce soon.